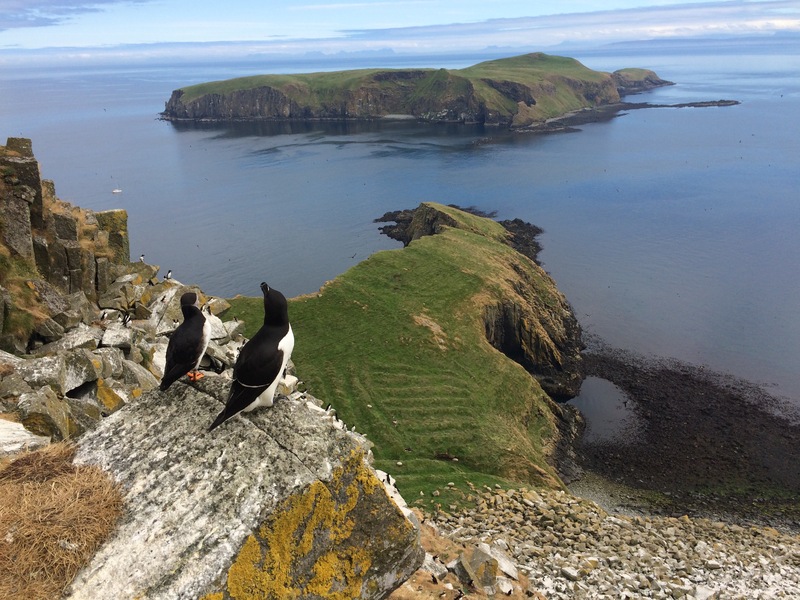 In the Shiant Islands, it’s nearly time for the fledging of the razorbill chicks and I have the amazing good fortune to be spending a week here as part of a sabbatical from my usual work place of Glasgow. 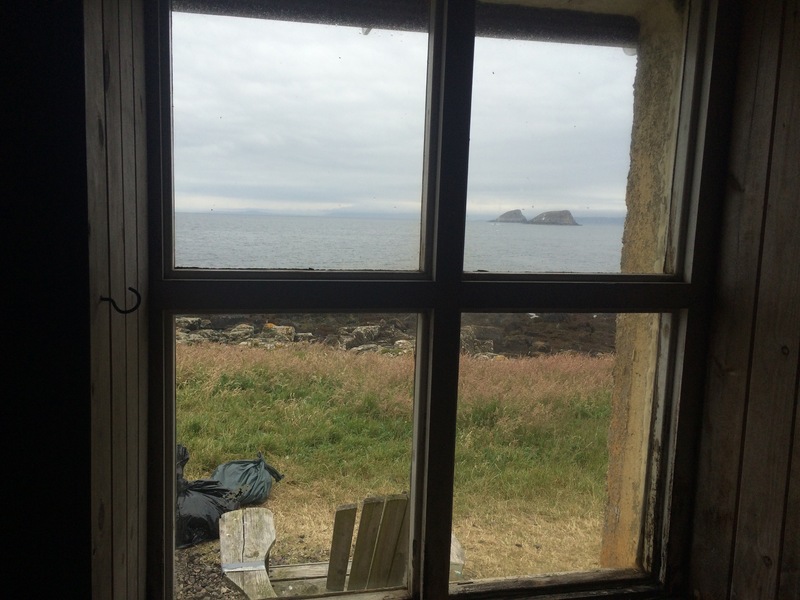 I’m swapping a basement office with bars on the windows for a small archipelago of islands in the Minch with spectacular basalt cliffs and boulder fields crammed with nesting razorbills and puffins. 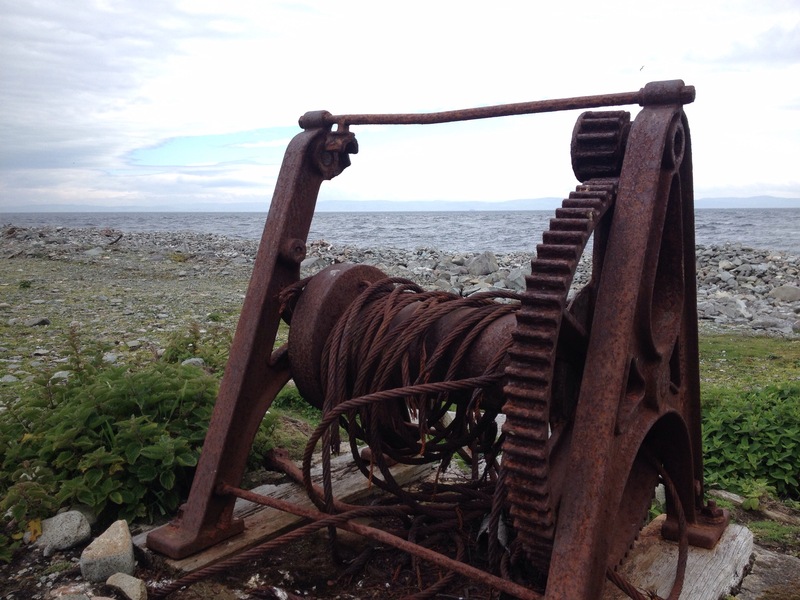 My two previous blogs on the island stay are Marooned with a Teenager and Geocaching for Rats . My week begins in the rather less picturesque surroundings of the forecourt of a petrol station on the outskirts of Stornaway. I am here in a large shipping container with Charlie Main, the Shiants project manager, so that she can give me the most essential piece of island expedition equipment, the white plastic bucket. Charlie gave me three buckets whose lids were labelled ‘carrots’, ‘eggs’ and ‘FRAGILE: horn speaker’. Each snapped closed with an extremely satisfying ‘clack’. Charlie explained the importance of packing all our food into the buckets to ensure no rats could sneak into our bags before the boat left the next day. I looked at the buckets and tried to imagine the mountain of shopping I had done earlier that day fitting into them, let alone the shopping list of food I needed to buy for the current project team in the middle of a 25 day shift on the islands. I looked around the container, it was almost half filled with plastic buckets remarkably similar to those I’d taken, some piles reaching right to the ceiling. “They’re all the spare rat poison” said Charlie. I made a mental note to line my buckets with bin liners just in case. 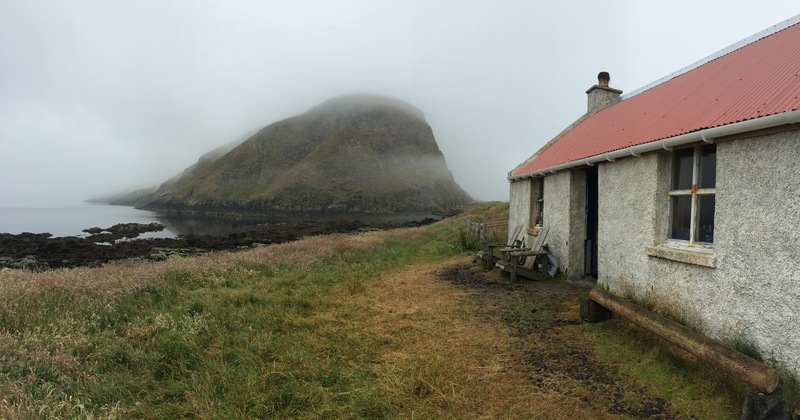 Once in camp on the Shiants, the white plastic buckets are ubiquitous. There is no running water on the islands so we use one for handwashing, and one to catch the drips from the water container on the worktop, they are full of field equipment, food, bits and pieces. “The first winter of the project buckets were propping up the shelves in the cabin and we made a whole bed base out of them” says Jonny. Between the Bothy (the Nicholson’s house on the island, where we are staying) and the RSPB camp, directly behind, was a pile of 9 buckets wrapped in duck tape. I get my induction on the ways of island life from John, a veteran of one Shiants winter and three summers. Biosecurity is everything – preventing a rat re-infestation – and so we need to ensure that nothing edible remains behind that the rats could eat. It is vital that, were a rat were to make landfall, their presence could be picked up by the monitoring stations left around the island. Back in Stornaway Charlie had shown me the thick brown pucks, shiny and smelling strongly of chocolate, which are used to monitor rats, the early warning system for a new colonisation. Rats find the chocolaty smell irresistible and will leave their gnaw marks on the wax but alternative food on the island distracts the rats from the bait stations. This means that all compostable waste needs to be taken off island in yet more white plastic buckets. John finishes my induction into island life by introducing the toilet facilities. 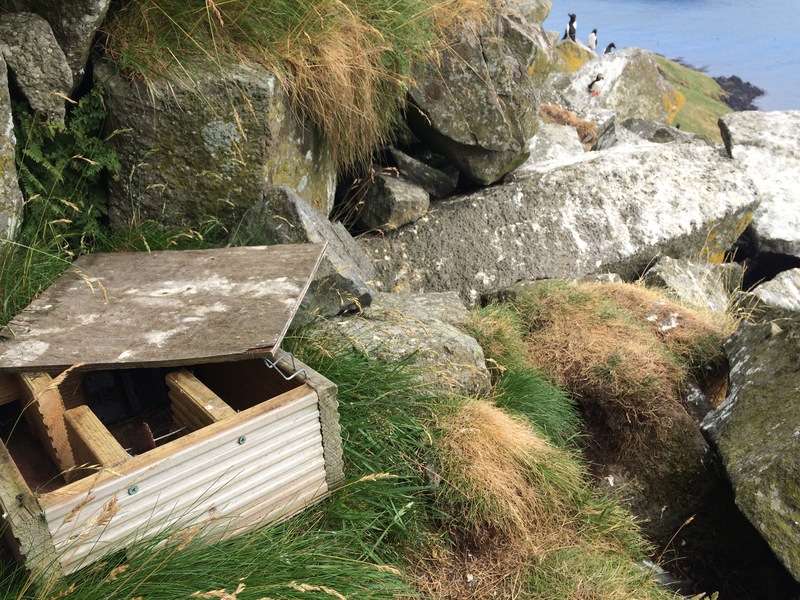 It turns out that human solid waste can, rather unspeakably, also distract the rats from the bait stations so that needs to be taken off island too. This means that we will be pooing into bags for the duration of our trip. The setup is relatively sophisticated, the system was developed by a charity for their work in developing countries. John takes me into the small gap between the two portacabins where a little tent is pitched. A toilet seat that clips over the biodegradable bag suspended over a bucket. When you’re done you just remove the bag, tie a knot in it and put it in a white plastic bucket. “It’s important to remove as much of the air as possible” says John helpfully. I ask about how many white plastic buckets of poo they had removed from the island so far on their mission but, to my surprise, they haven’t been keeping a tally. “At one time we were trying to do a calculation of the weight of food we were bringing onto the island versus the weight of poo going off, but I don’t think we managed” said Jack, another of the Shiants team. And suddenly I feel extremely glad that we have those extra multipurpose white plastic buckets. We’ll all be able to avoid the squishing of poo bags into buckets. 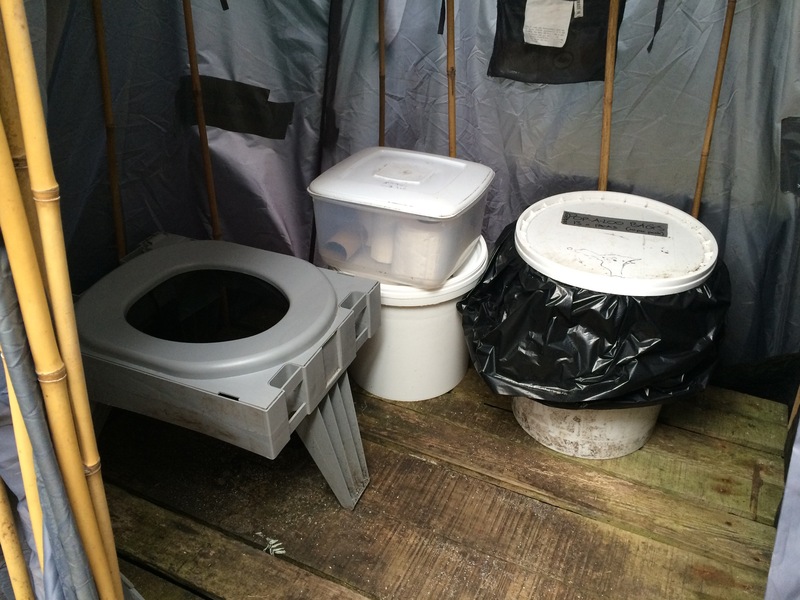 * I later asked John whether the poo buckets are the same buckets you used for the rat poison” . “No, no,” he said “They don’t allow us to put anything in the buckets that had the rat poison in, not even poo”. 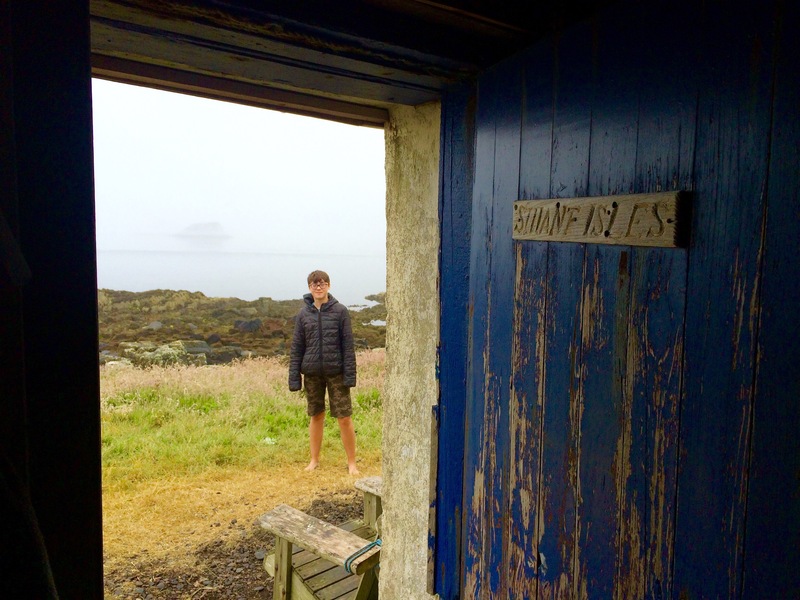 The second in a series of blogs written while marooned with a teenager on an island inhabited only by bird researchers and 180,000 seabirds. You can read the first here. 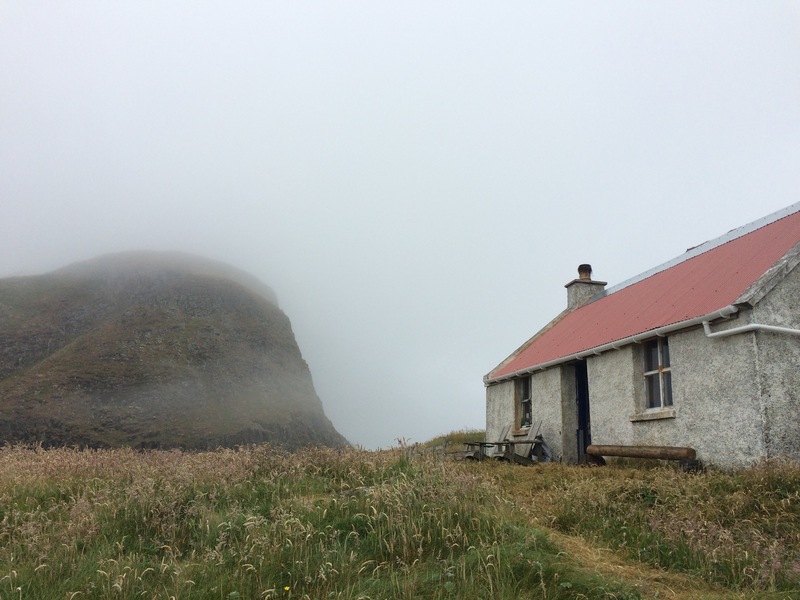 For a week I have had the immense indulgence of returning to my long-lost seabird fieldworker past in the most sublime surroundings of the Shiant Islands. 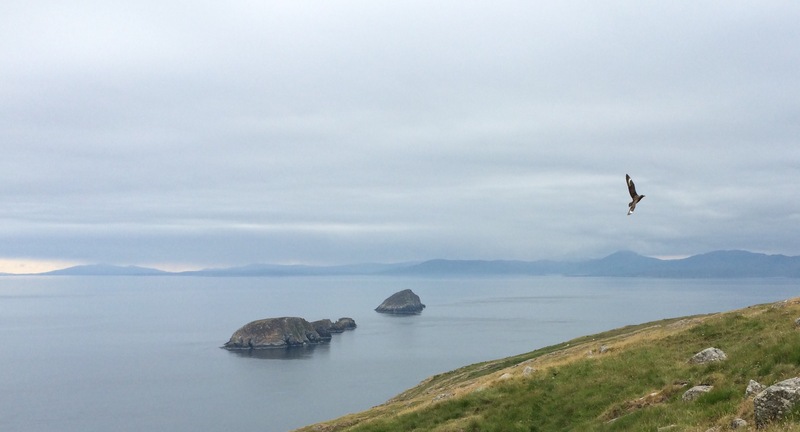 Three pieces of rock rising out of the Minch and covered with a dense layer of puffins and other seabirds. This week is part of a quinquennial sabbatical (we only get four weeks…. don’t get too excited) and I am here to help out my RSPB colleagues while doing a bit of writing. I’ve brought my husband, a proper seabird researcher who should be useful, and our thirteen-year old, who may be less useful. And we are trying to immerse ourselves in the life of the field camp. 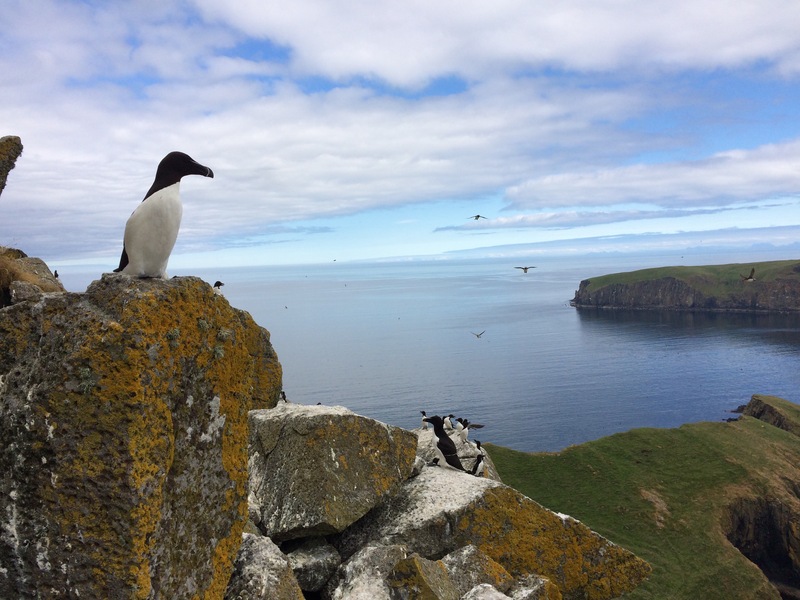 Over the past week I have observed that many of the typical activities of a field worker on a seabird island should to be familiar to a thirteen year-old. It doesn’t mean they are activities that a thirteen year-old would deign to partake in, they’re not Fortnight, or the Floss, Snapchat or watching endless episodes of Modern Families, for goodness sake. In fact they are activities from the good-old pre-teenage years but, given we are miles from wifi and the means to charge devices, (not to mention running water and conventional toilet facilities) there isn’t much competition. So, for the benefit of those who have been in this situation, or are planning to take a teenager to a seabird island, here are our observations. We trek over to the other side of the island with clipboards. We have a laminated black and white photo of the kittiwake cliff with all the nest sites marked and numbered, a telescope and a packed lunch. The task is to find all the nests marked on the map and record whether they have chicks or eggs and how many. This is far from simple where there are over 100 potential nesting sites that were recorded at the beginning of the season. It turns out that, due to a misspent youth of kids comic spot the difference, Naomi is excellent at matching the faint lines on the photo of the cliff to the actual nests. ‘spot the similarity’ with100 of them to find rather than just the usual six. The ‘Where’s Wally’ skills come in when we are looking for chicks. It seems that it has been a very poor year for the Kittiwakes and we see only 9 chicks between the nearly 60 active nests. You need a bit more patience for this game though – chicks are often behind a parent Kittiwake, or underneath, and we need to wait until the adult moves. “Can’t we just throw a rock at them” asks Naomi. Instead we play a whole round of ‘The Minister’s Bird Species’* and still two stubborn kittiwakes stay rooted to their nests, moving after a further 20 minute’s wait. 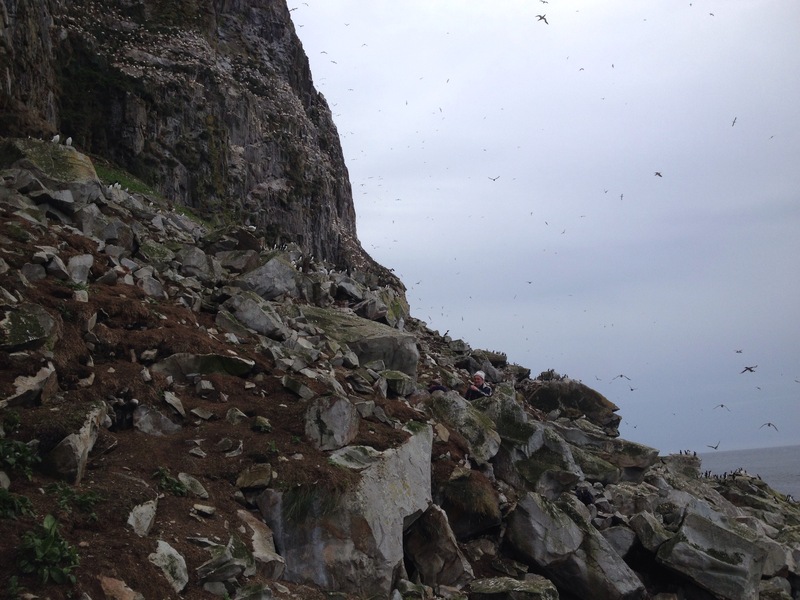 This activity involves a high level of jeopardy, half of the nests are burrows on vertiginous and slightly damp grass slopes and you are wearing waterproof trousers, and the other half are in cavities between stacked boulders on equally vertiginous slopes. The idea is to find the bamboo cane markers and then lie down on your tummy and insert your arm as far into the burrow or cavity as you can. You are not permitted to wear gloves and your task is to feel for the fluff of a baby chick, or an empty cavity. We found that the teenager loved the excitement of reaching through a poo-encrusted burrow to see what she would find, especially when it is the fluff of a baby puffin. The other element of jeopardy comes in if an adult puffin is in the burrow. If this is the case it is likely to take great exception to your hand invading their nest cavity. And as everyone knows – Puffins have very big beaks…. John and Jack, two of the RSPB team, locating the puffin burrows in the study plots. This activity is for all intents and purposes identical to Geocaching. 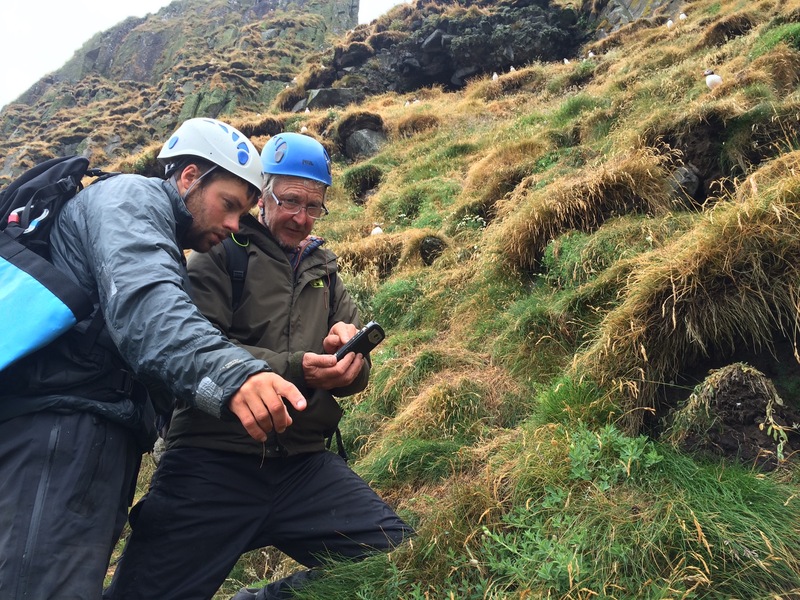 You get a geolocation for a number of rat monitoring stations in an area and then use a GPS to find them. The monitoring stations are either plastic boxes with two holes, one at each end, for rats to enter by and baited by a puck of chocolate flavoured wax. The task is to find the box and check the wax block for signs that it had been chewed by a rat. You take away the old wax block and put in a new one. On the Shiants there are now permanent rat monitoring stations around the island where rats could make landfall if they reinvade, we checked those in two areas, an old settlement which was reletiveky straightforward and the top of the boulder field colony on steep grass and cliffs, which was rather nerve racking and we were glad that Naomi hadn’t want to join us for that. This is one of the most exciting games on the bird island. We didn’t play it in the full version on the Shiants, we just walked through the bonxie territories keeping a look out for chicks to see if we could find any. 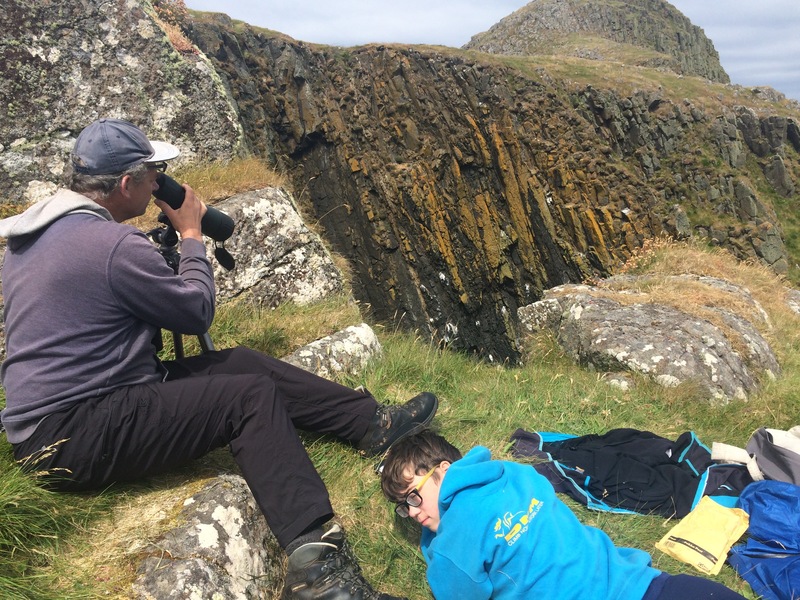 However we had previously played the full version, nine years previously, taking our 6 year old to help us find all the bonxie nests on Mingulay so we could ring the chicks. The idea behind this game is you need to seek out a well-hidden and extremely fiercely defended great skua chick in a boggy grassland with cliffs on all sides. The chick will be motionless, hiding behind a clump of grass or within the heather and the parents will fly sorties around your head, menacing you with their deep and blood-chilling “karr-karr”. The close passes and terrifying dives increase in intensity as you reach your target. The final activity is the best, according to the daughter. And this is the ride back on the RIB, back to civilization and wifi, back to phone chargers and sullen teenagers. 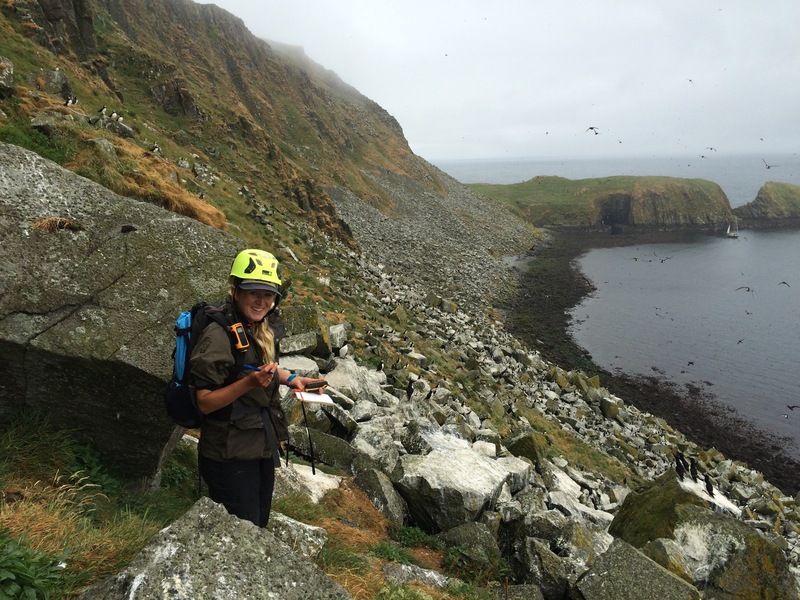 I’m not sure we’ve made a seabird ecologist of Naomi quite yet…. 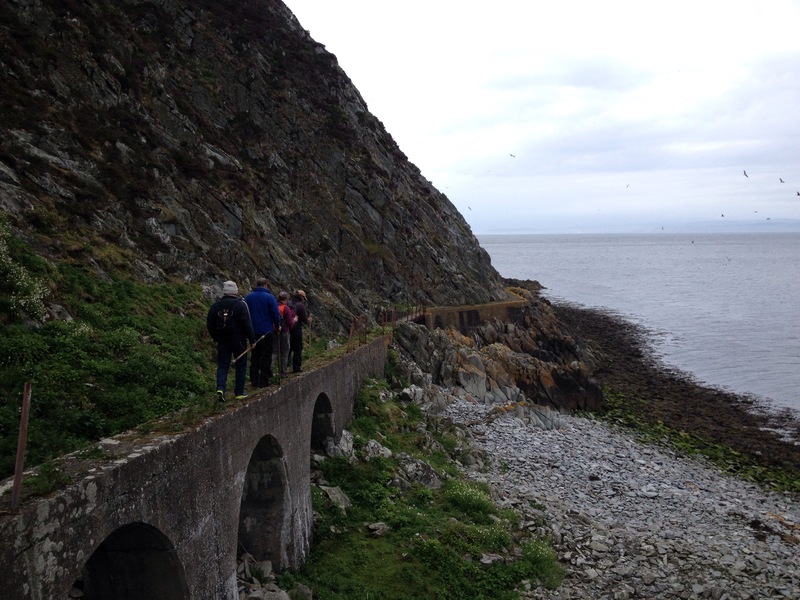 I am on Ailsa Craig as party of an RSPB Scotland group surveying the islands bird, plant and invertebrate life. We make camp in the midst of the industrial decay then set off for our first task. The route of the old railway bringing stone from the North quarry to the pier makes a rather unsafe footpath to the cliff we want to survey. 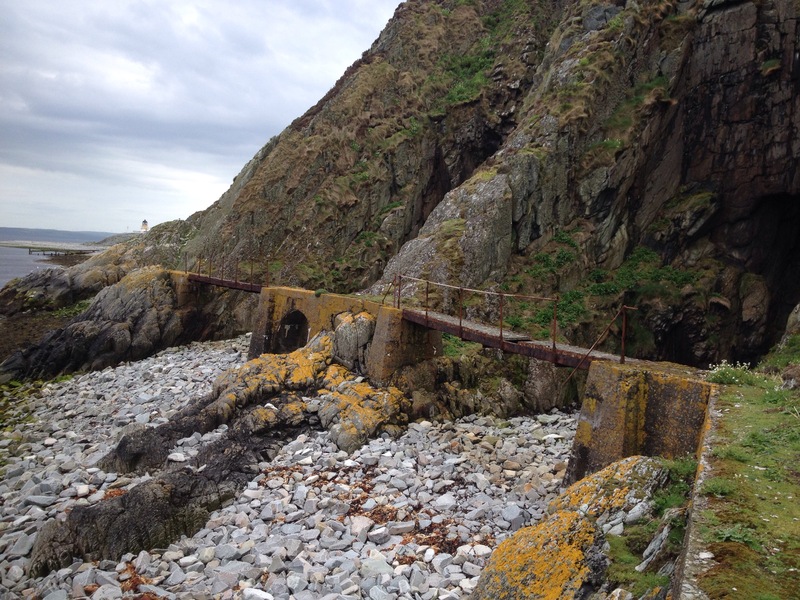 Rusted iron and rotten wood bridges over rocky chasms give us visions of a Hobbit-style chase across crumbling stonework and we retreat to walk along the shore. 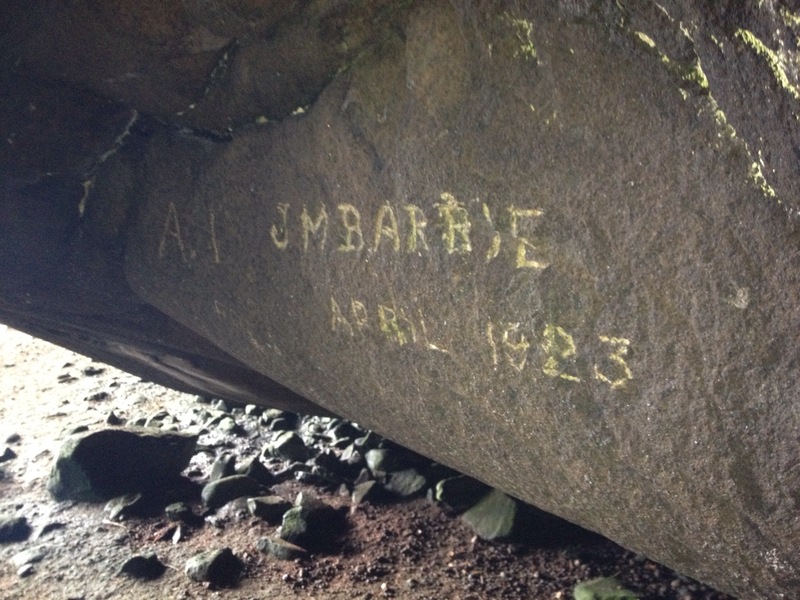 We pass a cave strewn with dead rabbits, broken eggs and limpet shells where JM Barrie had once stopped to carve his name into the wall. My task, when we reached the seabird colony on the steep cliffs that run from the north foghorn, round the west, and almost to the south foghorn, was to look for bridled guillemots. This part of the cliff is the only one that can be seen from the shore, and it is where the regular detailed counts take place. Bridled guillemots are the rarer form and they have a delicate white monocle around each eye. It’s like looking for a needle in a haystack – but harder. And then I find one. A beautiful creature to seek in my ornithological Where’s Wally? My colleagues count kittiwakes, guillemots, fulmars razorbills and then we get started on puffins. I used a little silver clicker that ticked satisfyingly in my hand with every count.